circled by the Moon, Sun, planets, and starry zodiac. 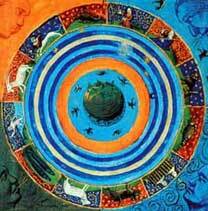 The Greek worldview was the most long-lived in the history of scientific cosmology. Closely tied to the pseudo-science of astrology, it continued from ancient Greece through medieval Islamic civilization to seventeenth-century Europe. Underlying the Greek worldview was the philosophy of Plato. He sought a deeper level of reality than that accessible to the senses. He also pursued a simple theory about the universe which had incredible explanatory power. The result was a belief in uniform, circular motion. This belief dominated the thinking of many Western astronomers and cosmologists for two thousand years. The task for astronomers was to ascertain the motions of the planets. Sky-watchers in the ancient Middle East, Central America, and China made many observations. From their tables of numbers, they devised schemes to predict future movements in the heavens. But the explanations that the Babylonians, Mayans, and early Chinese sky-watchers devised for these movements were no more than colorful myths. Scientific cosmology — the search for a picture of the universe that would make sense with no mention of divine beings — began with the Greeks. They sought to look beyond the patterns of numbers to something fundamental. Under Plato's influence, Greek thinkers attempted to devise combinations of uniform circular motions that would reproduce the observed motions, which were far from regular. Greek philosopher-scientists set themselves the task of envisioning the universe as a set of physical objects. Plato's pupil Aristotle came to dominate thinking in this field. Where Platonists thought in terms of the idealized mathematics of two-dimensional circles, the Aristotelians envisioned actual three-dimensional spheres. 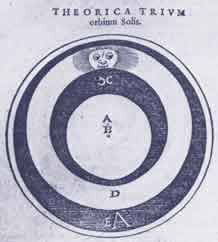 Aristotle taught that rotating spheres carried the Moon, Sun, planets, and stars around a stationary Earth. The Earth was unique because of its central position and its material composition. All generation and corruption occurred in the "sublunar" region, below the Moon and above the Earth. This region was composed of the four elements: earth, water, air, and fire. Beyond the Moon was the unchanging and perfect celestial region. It was composed of a mysterious fifth element. Greek philosophers estimated the distance to the Moon, and even tried to calculate the size of the entire universe. They believed it was finite. The outer sphere of the stars carried them on their nightly course around the Earth. The natural place for earthy material was down at the center of the universe. Earthy material tended to move to its natural place, toward the center of the world. Flames moved upward to reach their natural place at the top of the sublunar region. There could be no other worlds scattered throughout this universe, because their earthy nature would have forced them to move toward their natural place at the center. With the Earth at its center and the sphere of the stars its outer boundary, the Aristotelian cosmos consisted of little more than our solar system. Continuation of the Greek tradition of Plato and Aristotle is exemplified in the work of Claudius Ptolemy. He systematized hundreds of years of Greek geometrical cosmology with rigorous demonstrations and proofs. Ptolemy wrote his mathematical treatise, later named the Almagest, in about 150 A.D. He worked out geometrical systems of compound motions on two-dimensional circles to match the observed motions. The heavens were not made of rocks, metal, or other earthy material, but of some divine celestial material. This offered no obstruction to the passage of one part through another. Learn About Ptolemy: Scientist or Fraud? The spheres rotated because that was their natural motion. It was proper, Ptolemy believed, to attribute uniform circular motion to the planets because disorder and nonuniformity were alien to divine things. The study of astronomy, dealing with divine things, was especially useful for elevating the human soul. With regard to virtuous conduct in practical actions and character, this science, above all things, could make men see clearly; from the constance, order, symmetry, and calm which are associated with the divine, it makes its followers lovers of this divine beauty, accustoming them and reforming their natures, as it were, to a similar spiritual state. As the Roman Empire fell and civilization in Europe collapsed, the rising Islamic civilization rescued Ptolemy's cosmology — and improved upon it. The entire system was transmitted back to the West as learning revived there toward the end of the Middle Ages. Translations reveal the transitions. Ptolemy's mathematical treatise came to be called megiste, Greek for "greatest." This was transliterated into Arabic and prefaced with the definite article al ("the," also seen in words like algebra and star names like Aldebaran). Translated from Arabic into medieval Latin, Ptolemy's book became "The Almagest." The Arabs also taught the West "Arabic" numerals, the place-value system of calculating using zero, and many trigonometric techniques, all originally from India, and made important mathematical advances of their own. map the positions of bright stars. 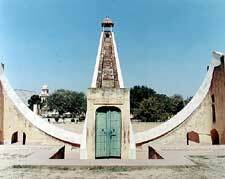 This great sundial at Jaipur, India, was built around 1730 for the Maharaja Sawai Jai Singh II. Called the Jantar-Mantar (Sanskrit for "Magical Device"), the instrument was modeled on one at Samarkand. Islamic civilization enjoyed a high level of scientific work. Astronomy was important for giving times of prayer (from the altitude of the Sun or stars), and the qibla, or sacred orientation: worshippers anywhere in the world needed to know the direction of Mecca so they could face it while praying, and mosques were oriented toward the holy city. 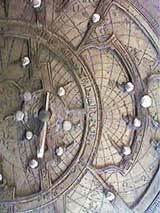 The astrolabe was the fundamental astronomical instrument, serving as a clock and navigational tool. Islamic princes also constructed giant instruments to measure the positions of planets and stars for astrological purposes. Among the Arabs and Persians were great calculators and mathematicians who worked to improve the cosmological explanation of astronomical measurements. For example, Nasir al-din al-Tusi at Maragha produced a particularly innovative addition to Ptolemy's circular motions. The "Tusi couple" calculates a linear motion from a combination of uniform circular motions. In his revolutionary work on the solar system published in 1543, Copernicus used a strikingly similar device. Also, Copernicus used a model for the Moon's motion identical to one devised two centuries earlier by the astronomer Ibn al-Shatir in Damascus. Copernicus cited the works of Islamic astronomers and certainly learned from them. Historians are still trying to determine the full extent of his intellectual debt.